By searching for the telltale, periodic dimming of light from distant stars, astronomers can spot orbiting exoplanets tens to hundreds of light-years away. But how do they know what these bodies look like? Perhaps they first try to imagine how the planets in our own Solar System might appear to a faraway alien world. A pair of scientists has released a detailed catalogue of the colours, brightness, and spectral lines of the bodies in our Solar System. They hope to use the catalogue as a comparison, so when they spot the blip of an exoplanet, they’ll have a better idea of how it actually looks. “This is what an alien observer would see if they looked at our Solar System,” study coauthor Lisa Kaltenegger, director of the Carl Sagan Institute at Cornell, told Gizmodo. With this data, astronomers might guess whether an exoplanet is Earth-like, Mars-like, Jupiter-like, or something else entirely. Scientists have discovered thousands of exoplanets, with thousands more to come, thanks to the Kepler/K2 missions and the just-launched TESS mission. With more exoplanets comes more data on their mass and temperature, and sometimes even spectra, the light signature of the elements in the planets’ atmospheres. Soon, missions like the upcoming Extremely Large Telescope and the James Webb Space Telescope could return spectra from lots of these planets. All of that incoming data motivated Kaltenegger and coauthor Jack Madden to make this catalogue of colours, spectra, and albedos, or how much the planet reflects starlight. 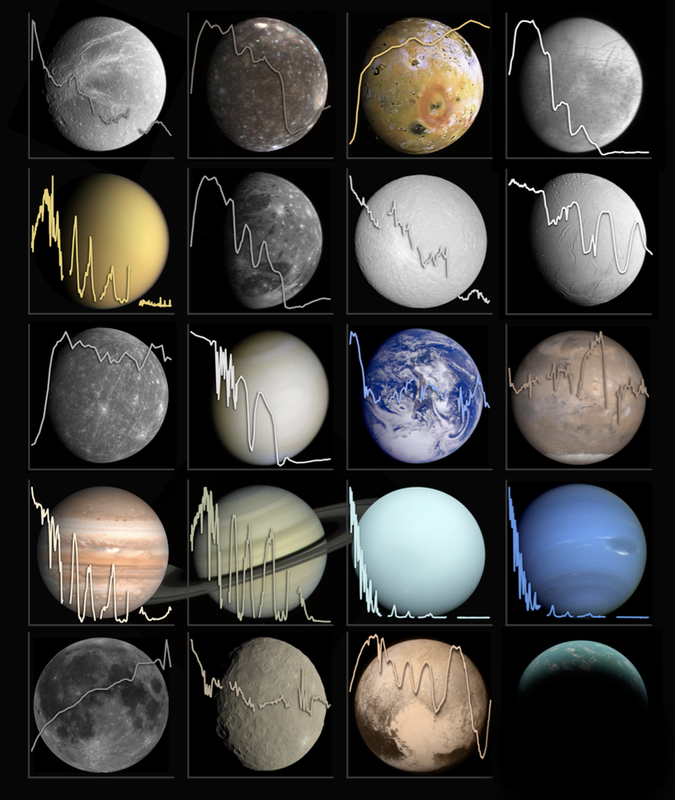 They analysed published data to create fingerprints for 19 objects in our Solar System, including all eight planets, the dwarf planets Pluto and Ceres, and nine moons. Their works is published in the journal Astrobiology. Both Christiansen and Kreidberg noted that there are important places where incomplete data may make two vastly different planets look the same. For example, the colours of planets with liquid on their surface and bone-dry planets look similar. That means next-generation missions need to take things like this into account. “The difference between a tropical, wet oasis and a desolate, desiccated rock is huge when you’re looking for habitable planet,” said Christiansen. Kaltenegger told Gizmodo she would like to update the catalogue to include more moons and cooler objects. But this data will be important for both planning future telescope missions and characterizing exoplanets.